The incident reportedly occurred early Sunday morning around 4am after 6ix9ine wrapped a music video shoot in Brooklyn. Sources close to the rapper say when he got home, he was met by three hooded men, who pistol whipped him and knocked him unconscious. When the rapper woke up, sources say he was in the backseat of a car as the men drove around, demanding jewelry and money. They even threatened to kill him, if he refused to turn over the loot. Shortly after, the men returned to 6ix9ine’s home. Two men went inside, while the third guarded the rapper in the car. When the men returned, they had around $750k in jewelry and at least $15k in cash. However, that wasn’t the end of the action-scene incident. According to TMZ, the men then drove away with the rapper still in the backseat. But, at some point, 6ix9ine managed to open the back door and jump out. Although one of the men initially tried to chase him, he stopped to refrain from being identified. 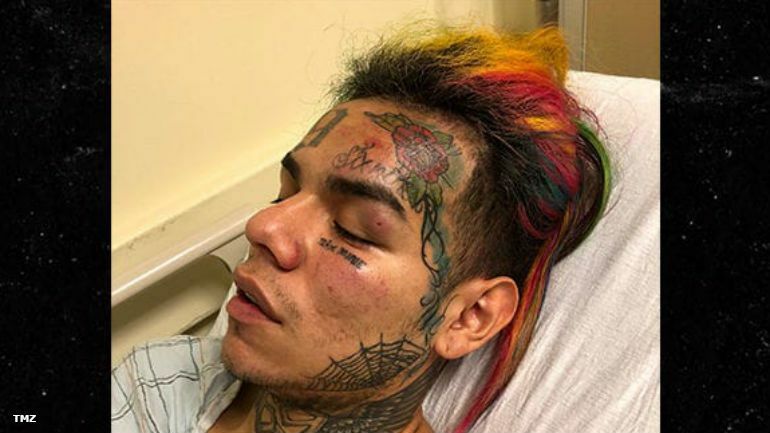 Once 6ix9ine was in the clear, sources tell the publication that he jumped in someone’s car and asked for help. The stranger then phoned officials and kicked the rapper out of the car. He was then taken to a local hospital, where he remains. According to TMZ, both Tekashi’s baby mother and his daughter were in the house at the time of the incident. But neither were hurt.